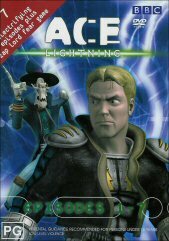 Ace lightning, what fantastic value, most DVD series only have about three to five episodes on one DVD, though Ace Lighting has a phenomenal seven episodes. You may notice the CGI (Computer Generated Images) that has been used on this DVD is very similar to the Transformers cartoon that was on Saturday mornings not too long ago. The CGI is pretty good though it doesn�t rival CGI of the likes of Spiderman or Monsters Inc but the quality�s still very good for a children�s low budget series. The story is of a young man named Mark Hollander from the UK who�s just moved in next door to the most popular girl at school. During Marks� first night in the new house he�s playing a game called Ace Lightning when a lightning bolt strikes his houses antenna, the strike bringing to life the characters from his computer game. Mark befriends the hero of the game, Ace lightning. After a short battle just outside Mark�s house between Ace and the evil forces of Lord Fear, Lord Fear�s forces run away to find a home. Holed up in a run down carnival, Lord Fear and his lackeys are hell bent on the destruction of Ace Lightning and his new side kick, Mark. Ace at the moment is homeless and is always popping up around the place draining power from Marks house putting the electricity bill through the roof. The next day at school Mark meets the girl next door and she obviously has a thing for him. Bullies at school pick on a poor fat kid called Chuck who unfortunately does just that, he throws up at the drop of a hat. Mark becomes best friends with Chuck, sticking up for him in the lunch room. Over the course of this DVD Mark gets together with the girl next door and dupes Chuck into helping all the time to save Ace, Chuck thinking that it�s all part of a game Mark played in the UK. A good DVD for any child aged five and above, CGI quality is great and there are no sounds that are corny or unbelievable, also a pretty sweet game on the DVD though you better have fast reflexes and a good DVD remote as you have to fight Lord Fear and his minions. Other features on the DVD include the CGI character biographies and also real people biographies. Here you can read specs on each character; their weaknesses, their strengths, and also their attacking abilities.